Karma Chameleon. Red-Gold-and-Green...Rooibos Tropics (Red), Chamomile (Gold), and Peppermint (Green). Loving would be easy if your colors were like my dream. Enjoy! Big Cat Rescue is one of the largest accredited sanctuaries in the world dedicated to abused and abandoned big cats. We are home to about 80+ lions, tigers, bobcats, cougars and other species most of whom have been abandoned, abused, orphaned, saved from being turned into fur coats, or retired from performing acts. What sets Big Cat Rescue apart is that we are working to end the abuse at its root by ending the private possession and trade in exotic cats through legislation and education. 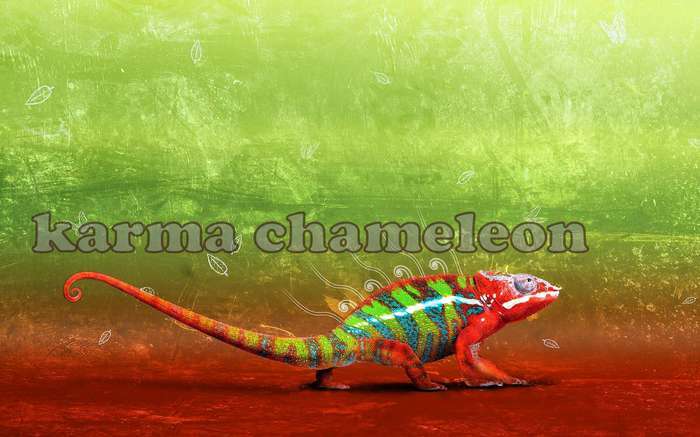 Karma karma karma karma karma chameleon, you come and go, you come and go. Loving would be easy if your colors were like my dream, red gold and green, red gold and green.